A compact shrub with dramatic variegated lime green and yellow leaves that stand out against the dark red tubular flowers. The flowers attract hummingbirds. It grows best in full sun to part shade in an average, well-drained soil. Prune after flowering as needed. 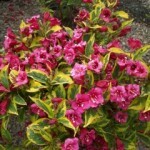 This Conard-Pyle introduction is the best performing variegated selection we have seen. PP 12,666.